I recently came across a useful recommendation for anyone who has ever been caught without his business card and wished he had one. The suggestion comes from Matthew Buchanan, who decided to scan his card and put it online at a location that is easy to remember. 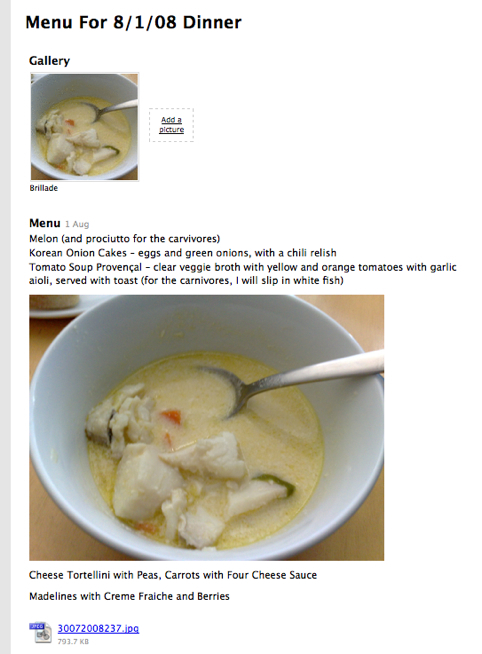 In his case, he purchased the domain IMetMatt.com, and he posted the business card image there. Now I don’t have to worry about ever being in a situation without my business card and miss making a connection with a potential client. Business travel seems to be one enormous headache, with the long security lines, the new fees for luggage, and the unrelenting crush of people on cramped airplanes. But perhaps the worst aspect of business travel is what happens after your return to the office: the dreaded expense report. As an independent consultant, I don’t have to file expense reports for all business travel. 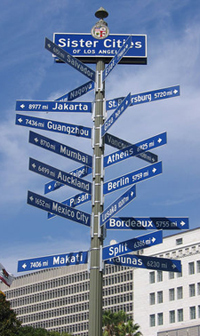 I do have to consolidate expenses to invoice my clients, however, which accounts for more than half of my travel. Over the years, I have developed certain techniques to decrease the pain of gathering expenses after the fact. For example, at the time that I book travel, I capture the charges and put them in my invoice tool of choice, Blinksale. Still, this only works for the big ticket items, and the majority of my expenses can’t be captured this way, like meals, taxis, and hotel charges. I have looked at various tools that work with scanners, such as Neat Receipts but my experience suggests that they are too error prone and fussy, and that particular solution is Windows/Vista only. I have a five megapixel camera in my cell phone and a scanner, so capturing copies of the actual receipts is easy. I can snap pictures of receipts while on the road, and throw away the originals. But the process of entering in the expenses is still a manual one, and I am sure that I miss expenses every once in a while. I recently came across a new service that could really end run this whole process. Expensify.com takes a completely novel approach to automating expense reporting. You sign up with the service and provide your credit card information. They send you a brand new Visa debit card, which you then use for all your expenses that you’d like to automatically track. They pass through the charges to your original card, so you can continue to earn points. But Expensify captures the expenses and accumulates them at their website, so you can go there and turn them into an expense report with a few clicks. You can also attach images of receipts to expense reports after emailing them to Expensify where they automatically put them in your account for you. The business model is simple: Expensify charges 3% of the funds that you pass through the card. This may seem a bit steep — $30 on a $1000 business trip — until you consider what the hour you might otherwise spend fooling with a spreadsheet is actually worth to you. My bet is that to the people most likely to file expense reports — serious road warriors — the $30 will look like pocket change. They also allow you to enter expenses into your account manually, so I am likely to continue my practice of putting the big charges directly on my regular card — airfare, for example, or the base room charges for hotel reservations — and capture that at the time I make the reservations. But now, when I am in New York, London, or Copenhagen, I will simply charge everything else — meals, taxis, and additional hotel charges — on my Expensify card, and snap pictures of the receipts. Expensify offers some additional benefits that make it even more attractive. You can forward the expense report electronically, and the recipient can pay directly by credit card. Expensify will credit the money to your original card. This could save me weeks of wait time, since my clients often cut a check or set up a bank transfer. In either case, I might be waiting weeks. There is a short delay when you sign up, since it takes a week or so for the new credit card to make its way through the mail. I can’t wait for mine to arrive. As of 9:00 a.m. eastern time, the Expensify site seems to be down. It says that it is down for maintenance, but hopefully it gets back up before the end of the day so all of you can check it out for yourself. Once again, we’ve asked online social tools guru Stowe Boyd to write for us on digital information management. Thank you, Stowe, for sharing your insights with us! In almost everyplace I have ever lived, there has always been one drawer — usually in the kitchen near the backdoor, or near a wall phone — filled with all sorts of junk: old chinese food menus, elastic bands, pencils, garbage bag ties, condiments, and nubs of crayons left over from elementary school. Basically a black hole of odds and ends that forms a backdrop of a hectic life, where there isn’t always a perfect place for every last thing. Sometimes you need a “miscellaneous” category, a catch all, a kitchen drawer for random things. I have a hectic life, but one that has increasingly gone digital. In the same way as my non-digital life, I have found the need for a general purpose information organization tool: a place to store the myriad bits of information that I use and share on a regular basis. My digital kitchen drawer is Backpack, an online information management tool from 37signals. 37signals is a company that has built an international reputation for its tools, like Basecamp (a collaboration tool for project teams), Highrise (a CRM tool), and Campfire (a chatroom solution). I have the “solo” account ($7/month), but 37signals also offers accounts for groups and with larger storage. Backpack is based on the model of a collection of pages, and on each page you can add, edit or delete any number of information scraps: notes, lists, files, photos, and writeboards. 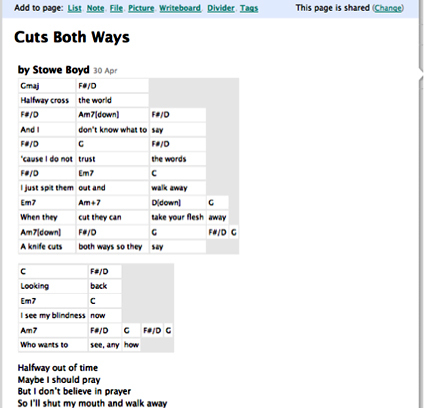 Writeboards are a 37signals sort of online word processing document — providing styled text — but otherwise not much like Microsoft Word. Because I use other tools for serious word processing, though, I hardly ever use writeboards. However, I use all the other bits and pieces. In the screenshot above, you see Backpack is open. 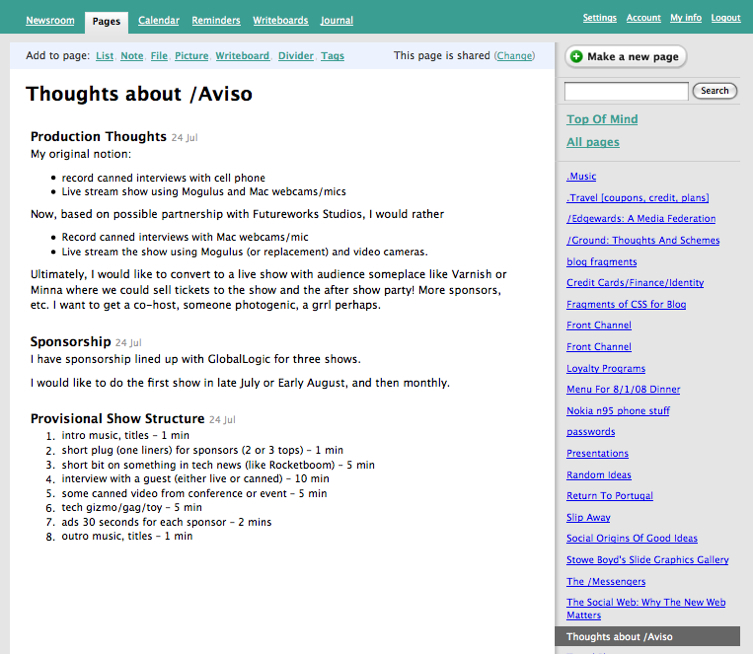 I have already logged in — it’s password protected — and I have clicked on one of the many pages displayed in the right-hand margin, in this case one called “Thoughts about /Aviso.” /Aviso is a monthly, half-hour web show that I will be launching at the end of August, and I have been using Backpack as a means to collect my ideas, and to share them with my production partners. 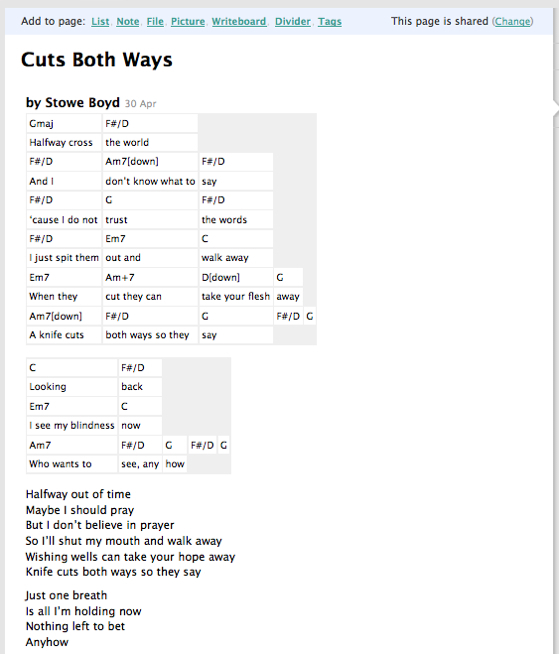 You can see at the upper right-hand corner that the page is shared: I invited some others to take a look at the page, and perhaps to edit it, although none of them actually made edits. 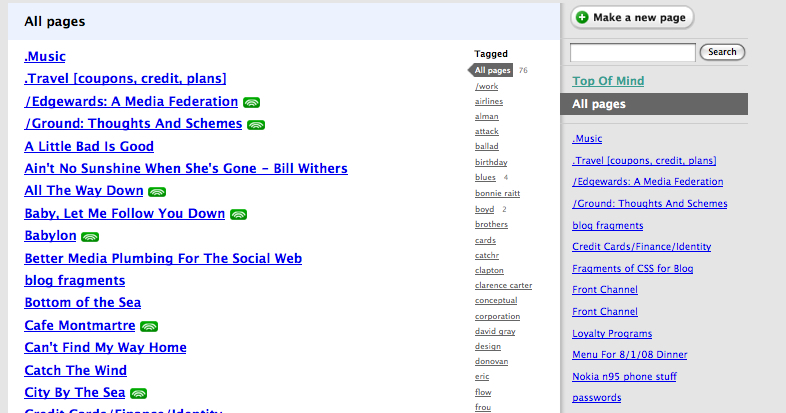 Backpack also allows publishing the page so that it is completely public, but I have not done so in this case. 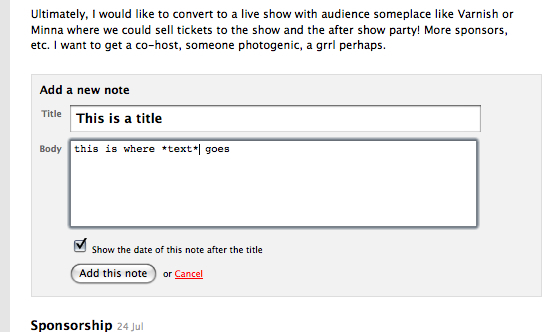 Here I have added an additional note field, created a title, and added some text. Note the asterisks arounf the word “text,” which is part of a markup language that Backpack supports called Textile. 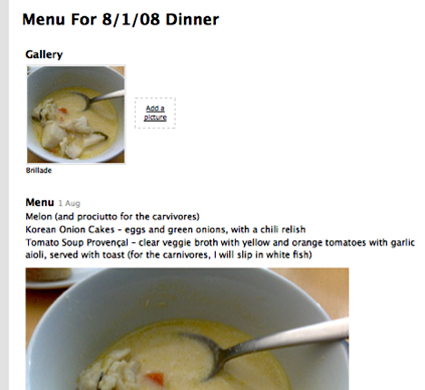 I could alternatively used HTML for markup, though, if I wanted to. Textile has some great features that I have used in many ways, such as the music in the screenshot below. This is a song that I wrote (yes, yes, a Renaissance man, I know, I know), and I have taken advantage of Textile’s simple technique for creating tables as a means of aligning chords with words. Needless to say, I have found this extremely helpful. And, I use tables in some often-used pages. For example, I have a page where I store passwords and IDs for various services that I use. Backpack pages automatically have an email address, and you can direct email to them, which occasionally can be useful. 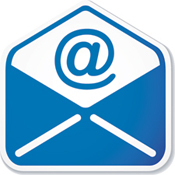 I have also used the email addresses for various online services that need an address, since it means that 1. I can later delete the page to avoid any spam, and 2. It keeps the email out of my inbox. Backpack provides a calendar and a reminders tool, but I seldom use them, since I work with time through my Google Calendar; however, these might be useful for others. I know that many people are uncomfortable with keeping information like their passwords in a service online. Since Backpack is itself password protected and encrypts transmissions through SSL, I am personally satisfied with that aspect of things. However, I do want to be able to get access to the information in the rare situation that I am not online, like my seat on a flight. 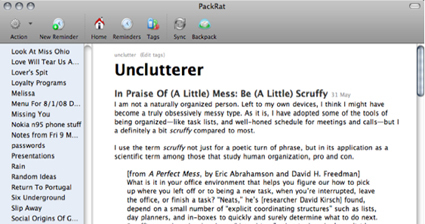 Enter Packrat, which is a companion application that runs on my Mac, and which synchronizes with my Backpack account. In the above image, you see that I use Backpack to write posts for Unclutter, and the nice folks at Unclutterer copy the material and post it on the blog. The only negative about Packrat is that I have to remember to synchronize with Backpack before getting on that flight to London or I won’t have the most recent information available. Backpack supports tagging, so I can pull up all my recipes, all my music, or all the pages tagged “Bonnie Raitt,” simply by clicking on that tag. Backpack was conceived principally for the needs of the individual, but scales up for small teams, or families. I already mentioned being able to invite others to share pages, which can be done with anyone, even people who don’t have Backpack accounts. Plus, a Backpack account can be set up with mutiple users, and they could share pages, calendar, reminders and the other capabilities of Backpack. One very interesting feature recently added is the “Journal,” which is designed to allow the members of a shared account to remain in contact like the popular Twitter service does. Similarly, 37signals recently added a “Newsroom'” feature that allows users to see what has been recently updated and by whom, which isn’t very interesting for a solo user like me. It’s one of those obvious things, in hindsight: As I used Backpack more and more, I discovered more ways to use it. Ultimately, I closed down other accounts — including 37signals’ own Basecamp — and migrated the bits and pieces of my messy, messy life into the free form pages of Backpack. It’s worked out well for me, and seems just as natural now as that kitchen drawer. At Unclutterer, we know that getting started on an organization project can be a difficult task — especially when your home or office are in complete disarray. Since we believe in baby steps, we wanted to present a guest post from someone who has found that a little mess is still better than a lot of mess, and that striving for perfection may not be necessary (at least not immediately). 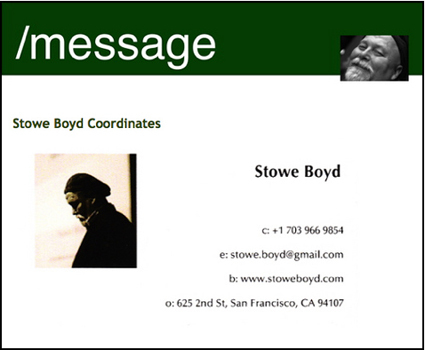 Thank you, Stowe Boyd, for once again sharing your valuable insights with us! I am not a naturally organized person. Left to my own devices, I think I might have become a truly obsessively messy type. As it is, I have adopted some of the tools of being organized — like task lists, and well-honed scheduling for meetings and calls — but I am definitely a bit scruffy compared to most. I use the term scruffy not just for a poetic turn of phrase, but in its application as a scientific term among those who study human organization, pro and con. What is it in your office environment that helps you figure our how to pick up where you left off or to being a new task, when you’re interrupted, leave the office, or finish a task? “Neats,” he’s [researcher David Kirsch] found, depend on a small number of “explicit coordinating structures” such as lists, day planners, and in-boxes to quickly and surely determine what to do next. Scruffies, on the other hand, are “data driven” — that is they don’t explicitly plan out and specify what they do but instead rely on the office environment to give them clues and prompts, in the form of documents lying on the desk, files piled up on top of the filing cabinet, comments scribbled on envelopes, Post-it notes (which , surprisingly, many Neats disdain) stuck here and there, books left open on the floor, and so forth. Worst of all, trying to make Scruffies into Neats won’t work, and will just make them less productive. They will just end up disorganized anyway. So, organizations may want to be somewhat more tolerant of (slightly) cluttered desks than they generally are. Many companies have an explicit clean desk policy that simply doesn’t take into account the brain/desk landscape relationship of Scruffies. Work areas should be kept neat and orderly. The Company must always look its best. Just as we are judged by our personal appearance, so is the Company. Good housekeeping makes it easier to organize your work, prevents loss of items, and provides a professional appearance. Excessive display of personal items is unprofessional. Supervisors and managers are expected to maintain a professional appearance in their department and stores, and they may request that you remove items if they detract from a professional appearance. In addition, they may require you to clean or straighten your work area. The implication is clear: a well-ordered desk leads to better work habits. Or else. Let’s be clear: I am not advocating McDonald’s wrappers under the desk, or a White Snake poster in the cubicle. But leaving your active work open on your desk when you leave for the day — three folders, a manual, a stack of reports on the corner of desk, and post it notes hanging off your PC monitor — could save an hour of time the next morning. Every morning. And trying to force Scruffies to be Neats just won’t work. Some of this is driven by senior executives who have assistants to keep their desktops empty, and some of it is motivated by a misplaced overemphasis on empty desks as a good in their own right, independent of actual functionality. Many extremely productive people rely on a messy work landscape. Looking at the desk of a busy scientific genius, it’s clear that the piles of papers and books that fill the surface give a pretty good indication of what an Einstein has been working on recently. You might say that a messy desk is fine if you are a Da Vinci, but the average guy isn’t a Da Vinci, and without genius you need structure to compensate. The evidence suggests otherwise. There is a psychological division in the world, and all the hypothetical benefits of an uncluttered desk simply don’t play if you are a Scruffy. There are many other benefits of (a little) mess, not the least of which is that the novelty of looking up from our task lists periodically, and scanning the real world for new inputs can enliven a hidebound agenda of work, work, work. I think that Einstein would have thought a (slightly) messy desk can play a structural role in helping people decide what is the next right thing to do given all the things you might do. Well, at least if you are a Scruffy, anyway. Productivity is for machines. If you can measure it, robots should do it. Perhaps he goes a hair too far into a glistening future, but we shouldn’t accept the premise that invention, insight, and imagination are less important than and somehow disconnected from the tangible landscape of our work, either. We have to accept a (little) disorder in the world, if only for inspiration; and for Scruffies, a smidge of disorder is like a signpost, pointing the way forward. Business cards: Replaceable with Evernote? 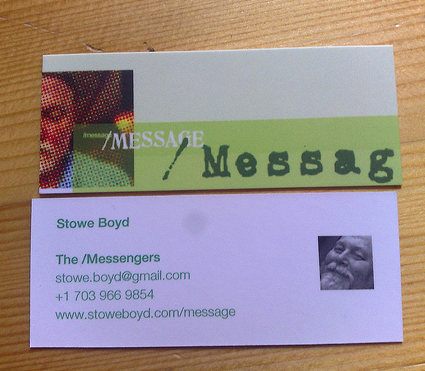 We’ve asked online social tools guru Stowe Boyd to help us tackle the subject of business card clutter. Thank you, Stowe, for again sharing your impressive insights with us! Business cards are essential, but the form factor — and the business practices based on it — are stuck in the 20th century in their form. They take up room, are inherently difficult to organize, and come in all manners of shapes and sizes. At the same time, who has gone to a meeting, a conference, or even a PTA meeting, and not walked away with a dozen or more cards with names, email addresses, phone numbers, titles … information that later on, down the road, you may want or need to use. I am aware that there may be services that will take this off your hands for a fee, and various applications that theoretically handle scanning and OCR of business cards, automatically putting contacts in your address book. I haven’t tried the former, but if it involves me mailing stuff to India or something, it’s just too much work. I have tried the scanner applications in the past, like Scanr, but I have never gotten anything like the OCR quality that would allow me to rely on them. Transfer pictures from the cell phone to my Mac. Move the business card pictures to an appropriate folder on the Mac, or upload to a web service, like Flickr, and in either case, name the file the name of the person on it. This is significantly less than the headaches involved with keying in all the data, but still too much work. 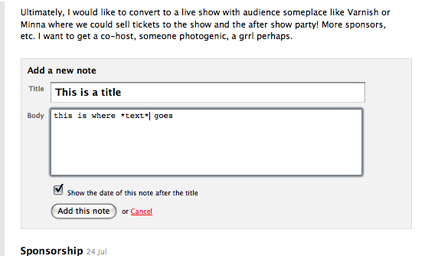 A few weeks ago, I bumped into a new application called Evernote that is the answer to my business card prayers. 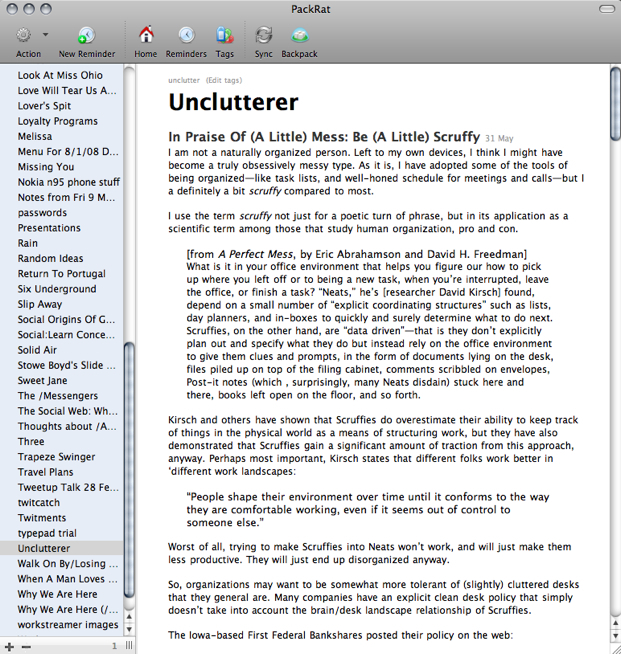 Evernote is both a desktop application for the Mac and a hosted website service, where users’ notes and images are synchronized between the two. Not only does Evernote allow me to organize both text notes and pictures of all sorts of things into folders, it also has very sophisticated OCR capabilities, able to find words on pictures of oddly shaped objects — like pictures of wine bottles. This capability works handily with relatively flat things, like, no surprise, business cards. I tested it by moving in all the business card images in that I had captured, and found an extremely high capability to find cards based on name, company name, zipcodes, and nearly anything else in the text. There are some glitches, but the success rate is very high. The beauty of this approach is its ease. It’s so easy that I actually take pictures of people’s business cards when they hand them to me, and hand them back! 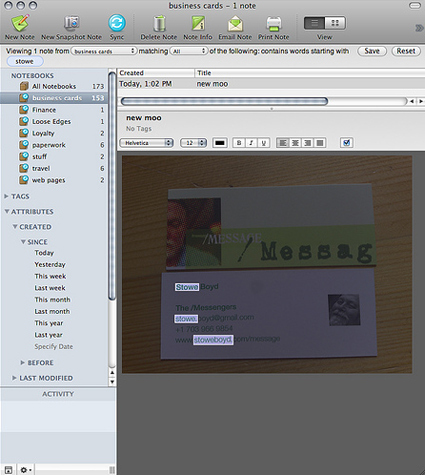 After an event — like the recent Web 2.0 conference — I simply move the pictures to my Mac, and then drag any business card images into the Evernote Mac application. If I revert to actually bringing back cards from an event, I can either snap them with my cell phone, or use the Evernote Snapshot tool, which relies on the iSight webcam in my Mac to take pictures. These are not as high quality as I get with my phone, however, and as a result the search capabilities on these images is less reliable. I was recently advised that I could email images from my phone directly to the Evernote application, which I have yet to try. I have boxes and boxes of business cards stockpiled, and I may never actually work through those. In fact, I recently just tossed several hundred cards that stretch back to the beginning of the Pleistocene. I did fish out a few, and snapped them, but mostly they went into the recycle bin. After all, people change phones and addresses frequently enough that a three-year-old business card is probably at least 50 percent wrong. Note that I also can use this to take pictures of whatever I find of interest, or of critical importance, on the web. I could use it to take a screenshot of a LinkedIn profile, for example, in lieu of a person’s business card. As another example, today I screenshot a travel itinerary (via Skitch) and dragged it into Evernote, and I brought it back up by searching for ‘oakland’ and ‘friday’. I am also moving my loyalty cards into Evernote — like my Jetblue, KLM, and Expedia Elite cards — so I don’t have to schlep those around with me, either. So don’t be too surprised when colleagues begin taking cell snapshots of your business card at the next mixer you attend, and then hand it back to you. They’ve probably gotten wise to Evernote. I love reading different methods for organizing email. Last month’s post from Lifehacker’s Gina Trapani started this discussion, and we’ve asked online social tools guru Stowe Boyd to keep the information flowing. Thank you, Stowe, for sharing your insights with us! Like many other web professionals, I have migrated from desktop email to Gmail, the Google email service. Gmail has many great qualities, like integrated instant messaging, large storage allotment, and integration with Google Calendar and Google Documents. But for reasons that are totally unclear to me, Google has chosen not to provide an integrated task list solution (or ‘to-do’ lists), either in Google Calendar or Gmail. However, a small Australian start-up has come to our rescue with an intuitive task list application, called Remember The Milk. 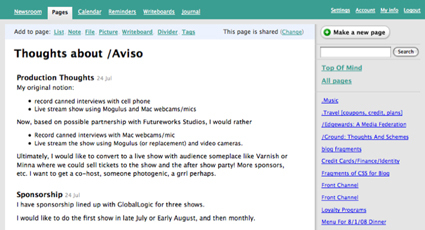 The application was originally devised as a standalone task list tool, with rich to-do list tools, including sharing tasks with others. But it is the integration with Gmail that I want to focus on today, since email overload is a growing problem for all of us. 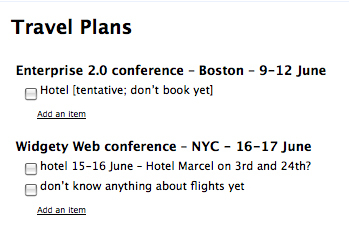 There is also an integration with Google Calendar that I will discuss in another post. 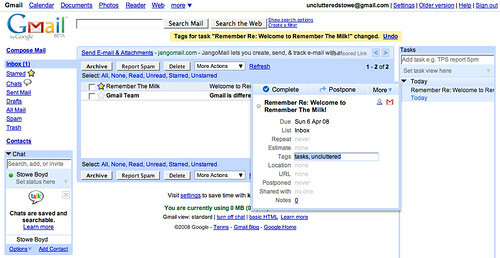 The Remember The Milk (RTM) integration with Gmail and Google Calendar require the use of the Firefox browser, which is free from Mozilla. For those of you that are not using Firefox yet, this may be the tipping point in that decision. Once you have installed Firefox, you will need to create a Gmail account, and a RTM account, and then install the Firefox plugin that implements the integration of the two accounts in the browser. 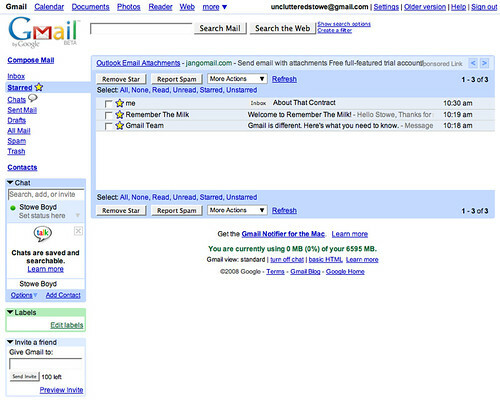 The now familiar Gmail interface is below, in this case, for a sample account I created for this article. 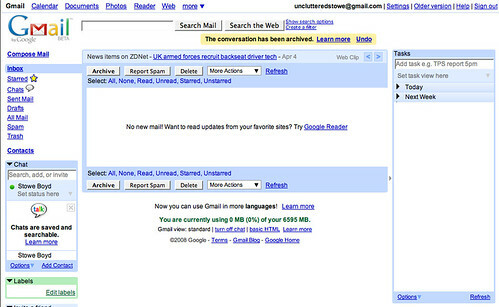 gmail, originally uploaded by Stowe Boyd. Once the plugin is installed, and you have logged into RTM, you will see a new column to the right on your Gmail interface. This is where tasks are displayed. RTM 3 col, originally uploaded by Stowe Boyd. At the top right, RTM’s Tasks widget allows you to simply type in a task, like “Review Quarterly Results”. Immediately below that is a ‘task view’ controller, that allows you to see only a subset of tasks at a time, for example, all tasks tagged “hiring” or tasks filed under “Work”. Under the task view, you can see the task area, in this case ordered by due date. At this point you might ask, “Why is it so helpful to have a task list in Gmail? Just because I have Gmail open on my desktop?” No. The real benefit is in responding to email immediately, and organizing your response to what is in the email. We all would like to have an empty email inbox, but very commonly we keep email in the inbox because we need to do something — call someone, look something up, check schedules — before we can respond. With a torrent of email streaming by, we can quickly forget the context for an email — what is the action we are supposed to take, when do I need to respond by, what sort of activity is it — and so we find ourselves reading an email all over again, a few days later, and realizing that we missed a deadline or forgot to follow through. With the RTM integration, I can simply use the Gmail Star feature for email, and automatically create a RTM task linked to the email. I can set a deadline for my response, for example ‘tomorrow’ or ‘9 May 2008’, and I can create a descriptive name for the action: ‘follow through with Jane Yoo on Jones proposal’. As shown in the screen below, there is an envelope icon in the task that links to the email, so when I get around to responding to a pending email task, I only have to click on the envelope and the email opens: no searching for the lost mail. RTM tags, originally uploaded by Stowe Boyd. Since adopting the RTM Gmail integration, I have found my approach to email has changed. I now proceed through email, responding to those that I can immediately, and deferring others by assigning an RTM task. I create a descriptive ‘next action to take’ as the task description, set a deadline for the action, and apply a few descriptive tags, like ‘travel’ or ‘billing’. After wading through new email, I then turn my attention to things that I have to accomplish today, which are (at least in part) listed in the RTM widget. I can pull up a bunch of tasks when it is time to handle them, like a group of planned meetings that need to be scheduled once dates for a trip are set. And as I complete the tasks, I can simply unstar them or click the ‘completed’ box in the task information: in either case, the task is marked done, and leaves the list of pending tasks. Yes, it is true that I have other locations where I also manage tasks, such as various online collaboration solutions, but the management of the cycle of email communications is significant enough to justify a dedicated solution to handle it, and that is exactly what Remember The Milk provides me.